Passionate about solving problems through design, Pallavi transitioned from a Bachelor’s in Biotechnology to a Master’s in HCI. She is fascinated with the personalization and customization of user experiences. Her goal is to create experiences that are not just seamless, but delightful. She has worked as a Product Design Intern at Visa, doing research, design, and usability testing for the Visa Direct team. 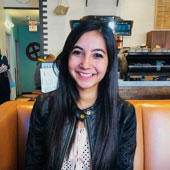 Previously, she was a UX Design Intern at Testbook, an education technology startup based in India. Connect with Pallavi on LinkedIn.